The original Almond Roca, supposedly named by a local librarian for its rock-like appearance, is a product of Tacoma, Washington’s Brown and Haley Candies. 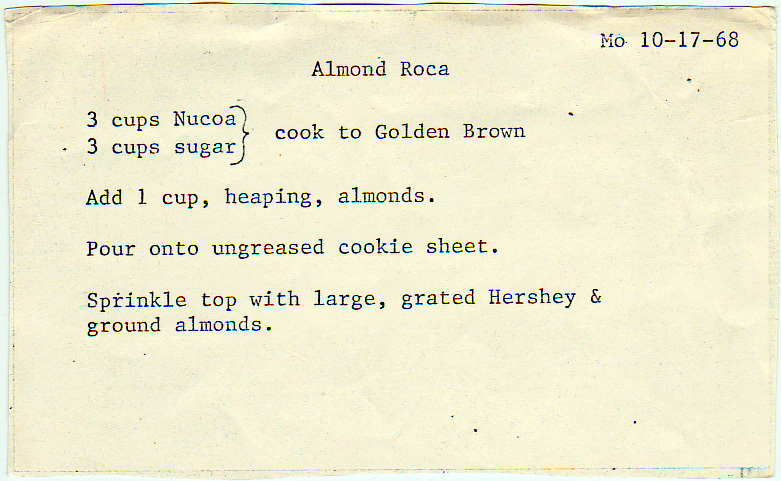 Almond Roca was first invented in 1923, and while Nucoa–a brand of margarine that now only exists as a different formulation in the Smart Balance line–does date from the 1920s, Almond Roca uses butter. Add 1 cup, heaping, almonds. Pour onto ungreased cookie sheet. Sprinkle top with large, grated Hershey & ground almonds. Swapping out Procter and Gamble for Kellogg’s.